In one sense only, you might say Glen Hoyle’s career hasn’t taken him very far. As an 1982 graduate of Providence College (PC), Hoyle was already working at the campus bookstore when management told him they liked the work that both he and his friend Tommy Rapoza were doing, and invited them both to stay on full-time. As childhood friends, growing up in Wrentham, MA, Hoyle and Rapoza had graduated PC together and would grow in their careers to both become managers. And so began a relationship between Hoyle, Rapoza and Barnes & Noble College with Providence College that has since deepened and traveled far indeed. 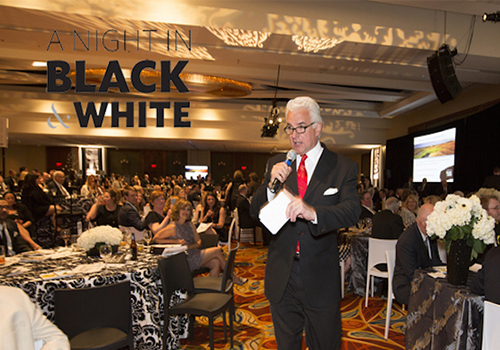 A Night in Black & White is a premier fund-raising event at Providence College, which brings together more than 700 alumni, parents, corporate partners, and friends of the college to celebrate and assist students with the financial burden of education. This year, the evening’s program also included a special accolade for Barnes & Noble College when it became the recipient of the first ever Providence College Black & White Corporate Partner Award. It was fitting that Hoyle accepted the award because part of Barnes & Noble’s outreach to the college includes a special and personal tribute – The Thomas Rapoza Scholarship – created after Hoyle’s friend lost his fight with pancreatic cancer in 2005. It was recognition of not just their friendship, but of Rapoza’s deep roots to the college. “We had been looking to take our contribution to the college to a more significant level, and felt it was appropriate to add Tommy’s name to the scholarship, both to recognize and remember him as an alumnus, but also for his work for Barnes & Noble College,” he explains. The scholarship is just part of a Barnes & Noble College program which extends from everything to the Providence College athletic department and student organizations, and supporting faculty through an initiative where older edition books are sent oversees to help the work of missions in Africa. “We try to support the College in their academic goals wherever we can,” explains Hoyle, who is quick to direct any praise for the effort to the Providence College Bookstore team, headed by Store Manager Joe Rushworth and Assistant Manager Debbie Bock. 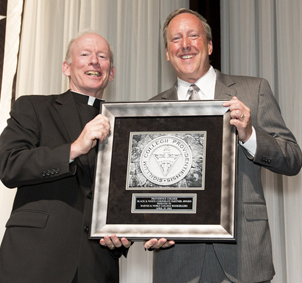 Barnes & Noble College Regional Manager Glen Hoyle accepts the Providence College Black & White Corporate Partner Award from Providence College President Rev. Brian J. Shanley, O.P. Despite a responsibility that now includes twelve college campuses, you might be forgiven for thinking Providence College has perhaps a special place in Hoyle’s heart. “I couldn’t be prouder of how we’re viewed by our customers on that campus, and as an integral part of the college,” he says. “I think that speaks volumes to the quality of our people, and the quality of this great college – that we can really assimilate into the school and become part of the fabric of each campus,” he adds.